Snorkeling is by far one of our favorite activities in the Caribbean. There’s something about seeing tropical fish and intricate coral in warm water that just confirms we’re on a sunny vacation. Because we’re sure we aren’t the only ones that love it, we’ve gathered together five of the best ports in the Caribbean for snorkeling. Time and time again, the Cayman Islands — and specifically Grand Cayman — come up as one of the best places to snorkel in the Caribbean. There’s a variety of depths and seascapes to enjoy in the clear blue water, including shipwrecks, reefs, and unique coral formations. 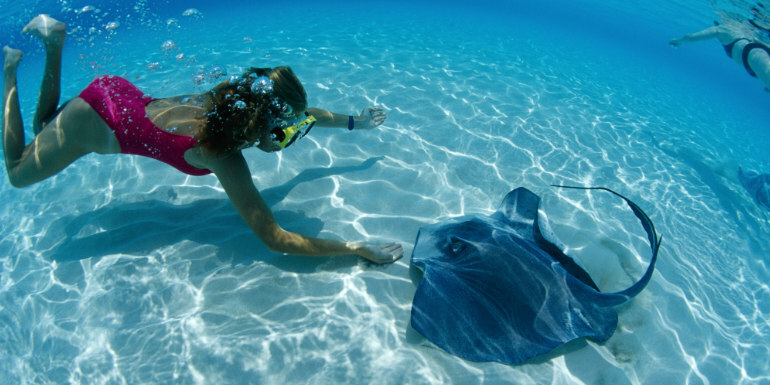 The most popular is Stingray City, where snorkelers can get up close and personal with the majestic sea creatures. 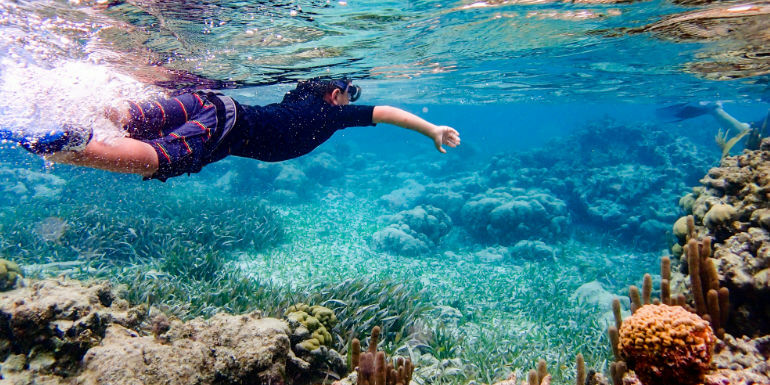 The most popular snorkeling spot near the Belize City cruise port is the Barrier Reef. The reef is perfect for beginners and experts alike because the depth varies — in some places you can touch the bottom, and other drop-off spots are more than 40 feet deep. Other great spots include Ambergris Caye (it takes a short flight to get there) and though Turneffe Atole is more popular with scuba divers, you can snorkel there, too. 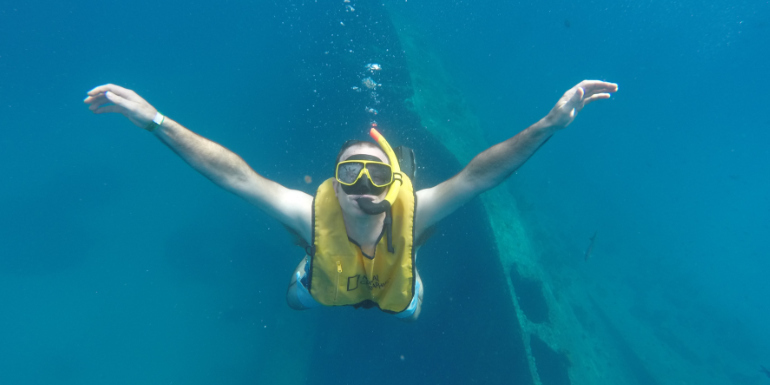 The popular cruise stop of St. Thomas and neighboring St. John have some exceptional snorkeling spots. 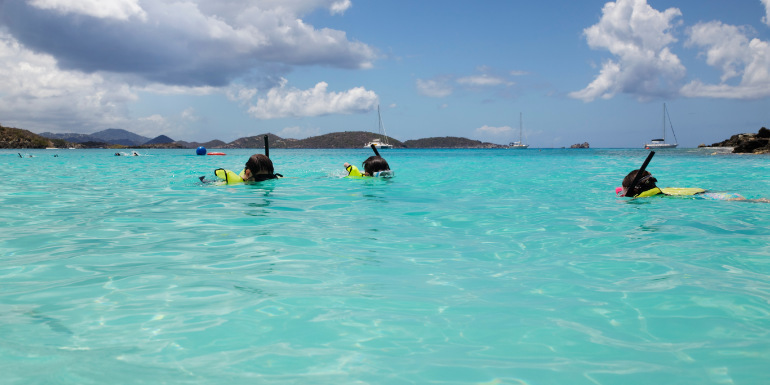 St. John’s Trunk Bay, part of the Virgin Islands National Park, has a unique feature: an underwater trail snorkelers can follow to see a variety of colorful coral and fish. Back in St. Thomas, the crystal clear waters of Coki Bay make it the best spot for snorkeling on the island, its gradual slope appealing to beginners in particular. 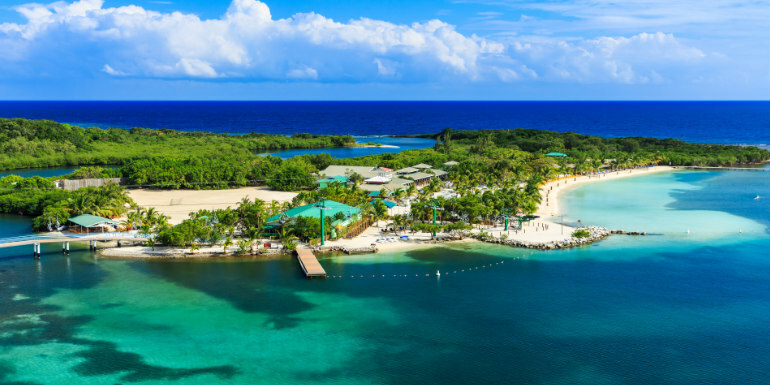 Roatan, Honduras is a snorkeler’s paradise, known for its clear blue and calm water thanks to the barrier reef that shields it from larger waves. The Honduran island is actually located at the end of the Mesoamerican Barrier Reef, the second largest in the world after the Great Barrier Reef. At various snorkel spots here, you can find dozens of species of tropical fish, sea turtles, coral networks, and shipwrecks to explore. While Aruba doesn’t have as many snorkeling spots as other Caribbean islands, the ones it does have are excellent. Mangel Halto Beach offers shallow, calm waters rich with sea life, perfect for getting close to the fish and coral. If you’re on an organized cruise excursion, it will probably stop at the Antilla Wreck, a sunken WWII ship lying 20 feet below the water. From the surface the vessel is easy to see, and there’s an abundance of tropical fish that curiously swim around and up near those snorkeling. What's your favorite destination to go snorkeling?